The market is filled with companies with a lot of hype which are touted as great investments, but Benjamin Graham taught that intelligent investors must look past the hype and avoid speculating about a company’s future. 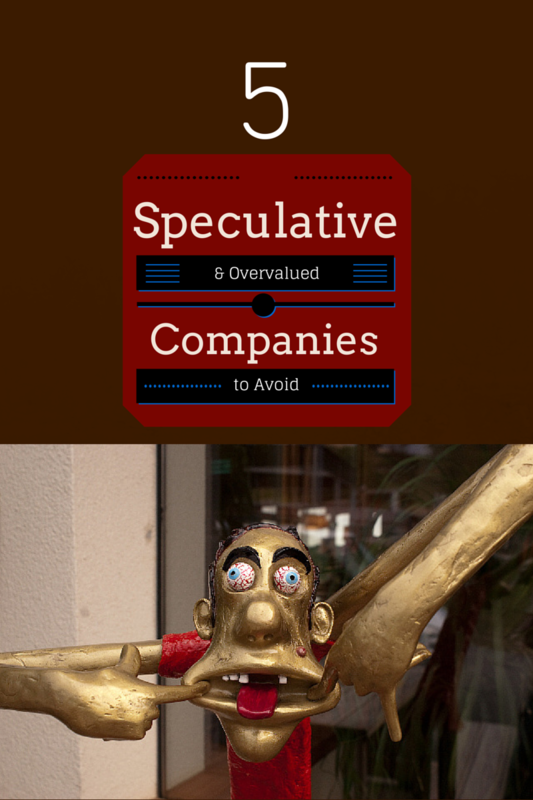 By using the ModernGraham Valuation Model, I’ve selected five of the most overvalued companies reviewed by ModernGraham. Each company has been determined to not be suitable for either the Defensive Investor or the Enterprising Investor according to the ModernGraham approach. This is a sample of one screen that is included in ModernGraham Stocks & Screens, which is available for premium subscribers and is a great resource for selecting better opportunities. Defensive Investors are defined as investors who are not able or willing to do substantial research into individual investments, and therefore need to select only the companies that present the least amount of risk. Enterprising Investors, on the other hand, are able to do substantial research and can select companies that present a moderate (though still low) amount of risk. Each company suitable for the Defensive Investor is also suitable for Enterprising Investors. It is clear that conservative value investors may wish to seek other opportunities. The Defensive Investor is concerned with the low current ratio in combination with the lack of dividend payments and high PEmg and PB ratios, while the Enterprising Investor has concerns with the low current ratio and lack of dividend payments. As a result, both investor types would find the company to be too risky to proceed. That said, any investors willing to speculate about the future of the company may go ahead with the next step of the analysis, which is a determination of the company’s intrinsic value. What do you think? Are these companies a bad opportunity for Intelligent Investors? Is there a company you like better? Leave a comment on our Facebook page or mention @ModernGraham on Twitter to discuss. Disclaimer: The author did not hold a position in any company mentioned in this article at the time of publication and had no intention of changing those holdings within the next 72 hours. Logos are taken from either the company page or Wikipedia for purposes of identifying the company only; ModernGraham has no affiliation with the companies.